More good news for one of the NW’s top WR’s out of Federal Way, as Mike Tate (6-1 175 Sr. WR) added D1 aa National Power Montana St to his list of offers. Tate informed us tonight that the Bobcats had come through and made their intentions known, becoming the 6th school to extend a full ride. Wyoming, Idaho, Portland St, Montana, and E.Washington are the others. 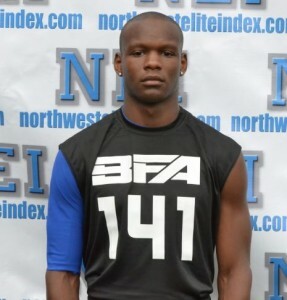 Tate is ranked as one of NEI’s top wide outs and is a two time all conference kid coming into the 2012 season. Tate traveled with us to Vegas as part of NEI-North, and broke people off for the better part of two days while there. Tate is a very talented track kid, and combines his speed with some other god given abilities to do very well for himself. Fed Way (2-0) is ranked #4 in the State of Washington in our latest 4a poll, and Tate is focused on the season right now. Tate says, ” its an honor that this many schools want me to play football for their programs, but when its all said and done I feel like the school I choose will be the perfect fit for me and my family”. You aren’t going to find a better character kid then Tate as he is someone that people look up to within the community. Just a quality individual on and off the field. We wish Mike and his teammates continued success on their season, as they are a team that could find themselves in the Dome.